(March 5, 1943) -- A military funeral was held on Wednesday afternoon at Stirratt's Funeral home for Cpl. 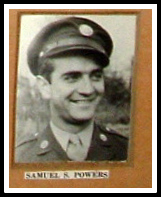 Samuel S. Powers who was killed last Friday when his four-motor army transport crashed in Homestead, Fla., shortly after its take-off from Morrison Field on a mission for the ferry command. Seventh local casualty in World War II, the Wednesday afternoon service and burial in East Ridgelawn Memorial park where attended by a group of ten soldiers from Jersey City. The Rev. Robert Falconer of St. Paul's Congregational church of which the deceased was a member, officiated. American Legion services were also held at the funeral home on Monday evening. Son of Mr. and Mrs. Samuel Powers of Newark, formerly of this town, the newly commissioned corporal, one of five crew members killed in the crash, would have celebrated his 25th birthday on Sunday. He was inducted on February 26, 1942, and completed his training as flight engineer at Kessler Field in Mississippi before being assigned to the ferry command at Memphis, Tenn. It is understood that he had been looking forward to a furlough in the near future. Last home on a four-day pas at Thanksgiving, his family said that he had just returned from a ferry trip abroad. Employed by the Canadian Bank of Commerce in New York for five years before entering the service, Powers had attended the American Institute of Banking for three years and was a graduate of Nutley high school. Born in Newark, he was raised here, and had played the saxophone in the high school band and local orchestras. He had been a member of the Boy Scouts, the Sagamores of St. Paul's church and the Royal Arcanum, Kempton Council. His parents, who resided at Yale street, moved to Newark after his induction. He is survived by 4 sisters, Mrs. Frederick Klein, and Mrs. Frederick Steengaard of Rahway, Mrs. Frederick Whitman of Waukesha, Wis., and a brother George of Kenilworth.